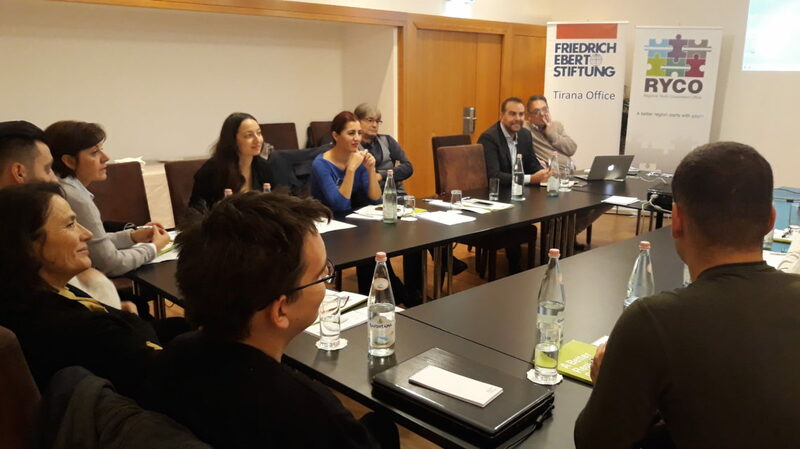 TIRANA – RYCO, in cooperation with the Friedrich Ebert Foundation in Tirana, is hosting the regional meeting of representatives of national news agencies and media outlets from the Western Balkans in Tirana on 26 – 28 November with the aim of creating new possibilities for regional media cooperation. Exploring new opportunities for the news agencies to get insights in modalities of regional cooperation and presenting good practices for increasing number of readers of the media outlets are parts of the meeting, too. Addressing the participants, RYCO Secretary General Mr Đuro Blanuša said that in order to achieve its goals, RYCO needs to build strong partnerships with a number of stakeholders, notably with the media from the region as they can truly contribute to the reconciliation and networking processes in the region. RYCO intends to start a discussion among the key media stakeholders in the region on the possibilities for cooperation and joint projects that will enable free flow of information among the societies from the Western Balkans that are burdened with the past. We also believe that media stakeholders should increasingly present positive narratives about the value of intercultural exchange in the region. We want to provide the media representatives with the opportunity to meet their colleagues from across the region. Moreover, RYCO wants to engage in discussions on good practices of the regional projects for journalists with the focus on young people as well as the examples of the European societies that managed to overcome animosities between each other and create an enabling environment for open discussions on the past, present and future.